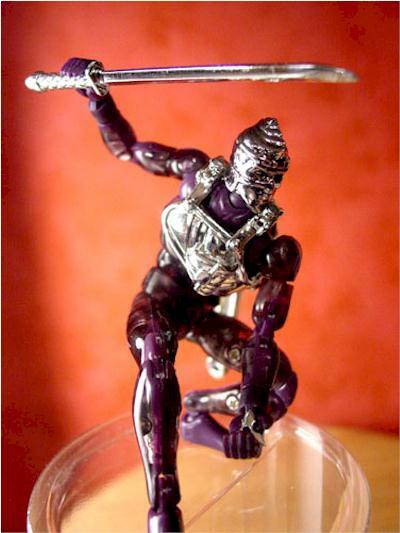 Baimun: Before Marvel Legends… Before He Man…. Before Transformers…. There were the Micronauts. 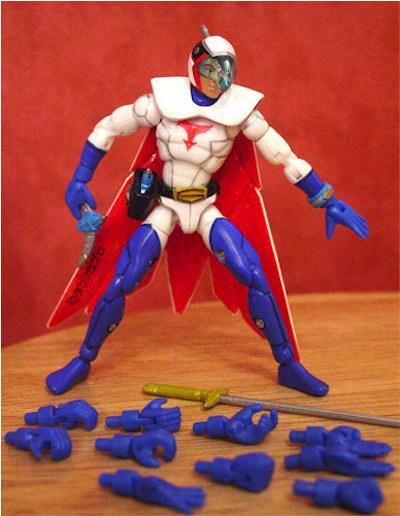 And the predecessor to the Micronauts was Takara’s Microman. 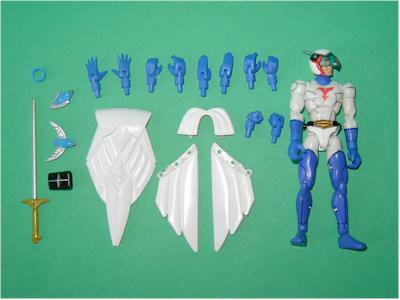 Back in 1974, Takara released a 10 centimeter tall version of their Henshin Cyborg line that was dubbed “Microman”. These pocket sized action figures were brightly colored, highly articulated, and had interchangeable parts. 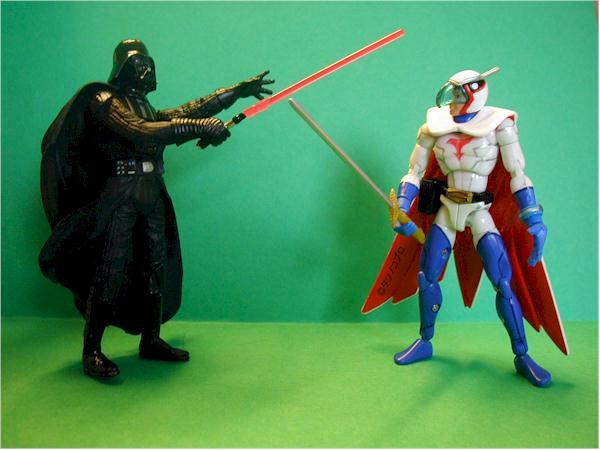 Later in the seventies, Mego imported them into the United States as the “Micronauts”. 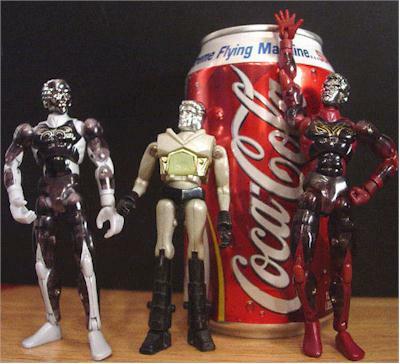 Takara continued to produce the Microman line throughout the Micronaut era, and beyond. 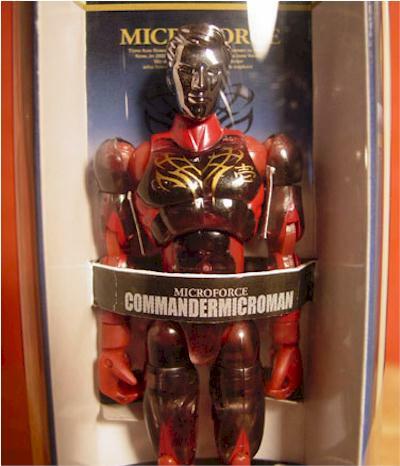 There were Microman figures that came in unique capsules, chambers, and even egg noodle cartons. 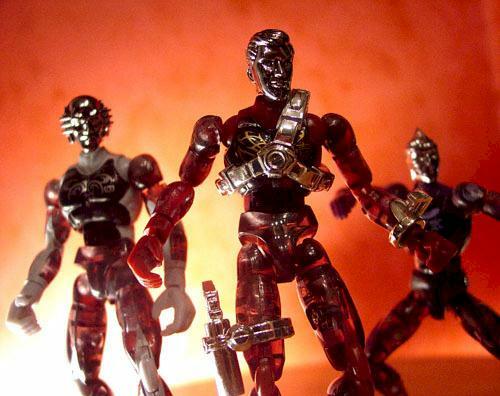 These “cyborg spy” figures gave birth to the Transformers. 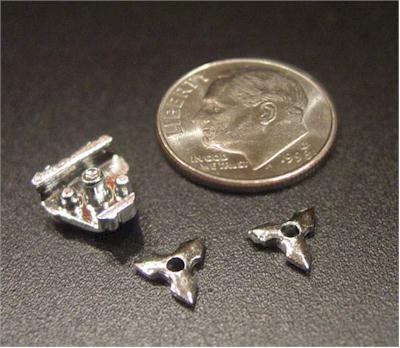 Takara has updated the Microman line for the Twenty First century as “Microforce”. 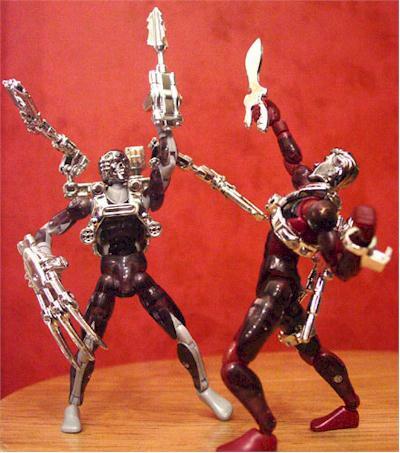 Like most of the Micromen and Micronauts of the past, the Microforce figures (Commander, Ninja, Spy, and Gunner) have chrome plated heads with bodies molded from various shades of translucent plastic. 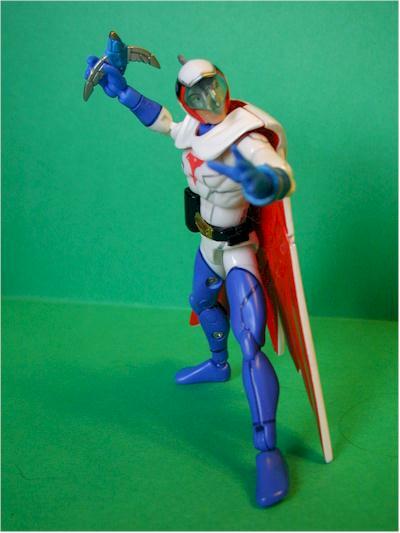 The exception to this is a “teaser” figure designed after “Mark” from the anime “Battle of the Planets” or “Gatchaman”. Next up will be a line dedicated to various anime heroes. These are not to be confused with the Palisades Micronaut line. Somewhere after Mego stopped producing the Micronauts, the name splintered off and became a separate entity. The Palisades figures are reissues of the Americanized Micronaut line… this is a brand new generation of the original Microman line. Harry: Gatchaman (or as it is better known in the U.S. - "Battle Of The Planets") is one of the true classics of Japanese Animation. Gatchaman/ Battle Of The Planets is currently seeing a big of a resurgence after it's original premier in the mid-70's; an Alex Ross comic book series, DVD re-issues, Gatchaman-themed advertising campaigns, talk of a new TV series and, of course, tons and tons of new toys from the likes of Jun Planning, Bandai, Medicom and Diamond Direct. (For a Gatchaman-completist like me all of this is a blessing and a curse!) 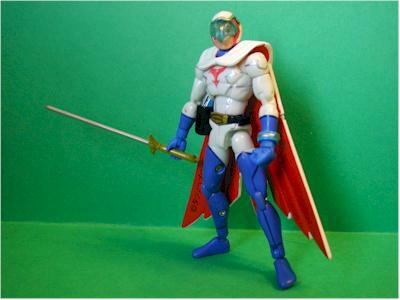 This Gatchaman figure is my latest (and greatest) find - it's the toy I've been hoping to find since I first started collecting Gatchaman stuff almost twenty years ago. 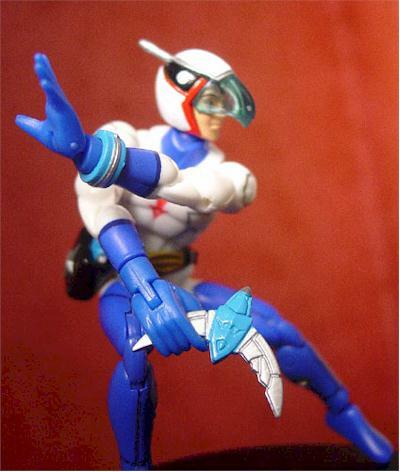 This preview figure is part of the new "MicroMan Tatsunoko Studio Hero Collection". 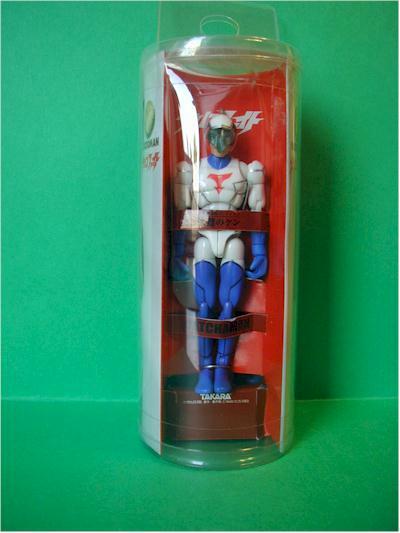 There will be a total of five figures; Gatchaman, Casshan, Polymar, Tekkaman and Voltar. Baimun: Each Microforce figure finds its way to our shores in a tiny, translucent tube. These are very unique and eye catching, but make it difficult to distinguish each different character except for the color of the insert and figure. All the accessories that are unique to each figure are in tiny plastic bags hidden on inside of the cardboard insert sleeve that the figures are strapped to like a futuristic Frankenstein’s laboratory table. Actually, the figures inside these tiny capsules almost look like astronauts in tiny hibernation chambers. Harry: The packaging of this figure is the one sore spot for me. The package promotes a minimal amount of waste but does a very poor job of highlighting all of the great things this figure has to offer. Baimun: Although the body design is purposefully left universally generic, the musculature is quite well defined, well proportioned and does a good job of hiding much of the figure’s amazing articulation. The joints are all tight fitting with a gap tolerance that would make Marvel Legends Spiderman go crying to Aunt May. The only painfully exposed signs of construction are the four tiny Phillips screws on the inner thighs and calves. The best part about these screws is that any industrious collector with an eyeglass screwdriver can open up a leg and use a tiny bit of tape or glue to tighten up any loose leg joints. This neat little bonus is what allows my vintage Pharoid from the 70’s to stand next to his new relatives instead of lying around like a rag doll. Each figure has a uniquely designed head sculpt and Mark’s helmet even includes the antenna out the back, and a translucent “beak” visor. Harry: This figure is just a tad angular. Not nearly as clunky as a Micronaut, of which this figure is a distant cousin of, but just a bit. Being as this is part of the new 'Microman' line I'm sure it is a stylistic choice so I can live with it. If I had to find one tiny complaint it would be that the plastic cape does prevents a bit of movement. Baimun: Considering these figures are smaller than some action figures accessories, the paint is very cleanly and evenly applied. Complimentary opaque colors create interesting designs on the translucent arms, legs, and torsos of the Microforce figures. All of the assorted hands are molded in a solid color that is matched quite well with the paint on the figure. Harry: There were probably lots of little area's they could have skipped on this figures paint job, but they didn't. The 'G' on his belt buckle, the Gatchaman insignia, the eyes on his helmet, the details on his sword and sonic boomerangs, everything's spot on. This figure has an angular line motif, almost like body armor, that wasn't a part of the original late-70's character design. This is a stylistic choice that is a bit like Gatchaman's mid-90's OVA series and recent Tower Records Japan commercial campaign. It looks great. Baiumn: All the figures share a revolutionary new body design and come equipped with accessories including a half dozen pairs of interchangeable hands. Takara has managed to pack all the articulation you would expect from a 12” Dragon or BBI figure, or even a 7” Marvel Legends figure, in a figure that less than 4 inches tall! Ball jointed neck, shoulders, chest, torso, thighs, and ankles are matched up with pivots in the biceps, forearms, wrists, waist, thighs, upper ankle, as well as twin jointed elbows and knees that allow arms that can fold in half to touch the shoulder, and the legs to bend in a full squat. The twin ball joints in each shoulder allow the arms to shrug forward, back, up, or down as well as rotate all the way around. Most of the wrist joints pivot vertically, but one pair or gripping hands is actually jointed horizontally to allow swords to be held in full fencing styles. Harry: I'm never exactly quite sure how you count all the joints up but least 26. 26 points of articulation on a 3 3/4" figure!! Michael, do you allow for bonus points? Baimun: These tiny soldiers are loaded to the teeth with more accessories then they can carry. Each Microforce figure comes with 5 additional pairs of hands (trigger hands, fists, open hands, karate chop, as well as the pair of gripping hands with vertical pivots and the grippers with horizontal joints.) All the bandoliers, swords, knives, guns, and holsters are chrome plated like the heads and are well detailed for their size. Ninja comes with what is arguably the tiniest functional accessory every included on an action figure. His bandolier has a removable holster on the front…. On the inside of this pocket are two pins holding two removable three-pointed throwing stars. Each throwing star is less than half a centimeter across… and could hide under a dime without touching each other. Mark comes with the previously mentioned hands, a sword, bracelet, throwing blade holster, open blade, closed blade, and a four piece cape. This cape makes the figure appear deceptively different from its translucent micro-brethren. Harry: Did you see the picture? A cape, communicator wrist band, belt pouch, Gatcha-Fencer sword, two sonic boomerangs and five additional sets of hands. All of the accessories are well sculpted and of high quality plastic. It really adds up for a myriad of display possibilities and just plain fun! Harry: So we have an imported Japanese figure from a classic series with 20 accessories and (at least) 26 points of articulation - How much would you pay? How about $5.49. Four more stars! Baimun: These figures are simply amazing. From the humbling amount of articulation to the generous assortment of interchangeable parts and accessories… these figures are more posable and have more personality than Stikfas, and at around $5.00 street price, are a bargain. It would not surprise me one bit if these take the place of Kubricks and Stikfas as the platform of choice for customizers. I might just have to go back to the store, buy an entire case of these little gems, and start my own Microforce Army. Harry: (As I'm sure you can tell) I love this toy! A classic anime character with a great sculpt, high quality, tons of accessories and lots of movement for a superb price. The most fun and enjoyment I've had with a toy in a long time. These (and soon the other four in the series) are available at your local comic shop for between $5 - $6. Now there's an even better reason to support your local comic shop. Head down now. Figures from the collection of Harry Hosono and Baimun.